So when the husband concocted a salad that starred one of my favorite vegetables, I insisted that he make it again. And again. And again. 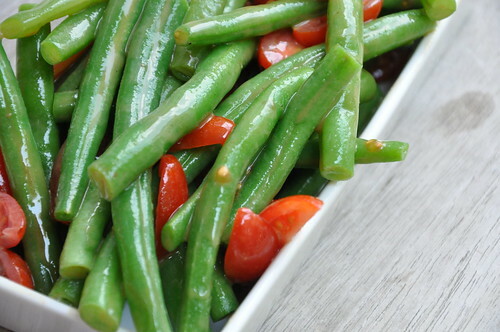 This green bean salad elevates the slender green minxes to new heights. 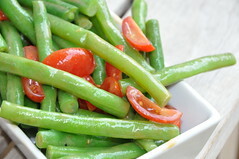 It features a tangy, sweet, light dressing that makes all the green bean’s best qualities stand out in relief. 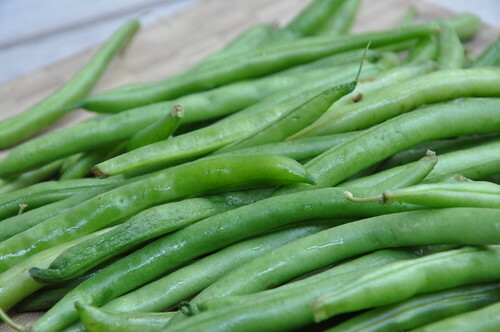 Think you’ve got some fresh, tender, delectable green beans from the grocery store? 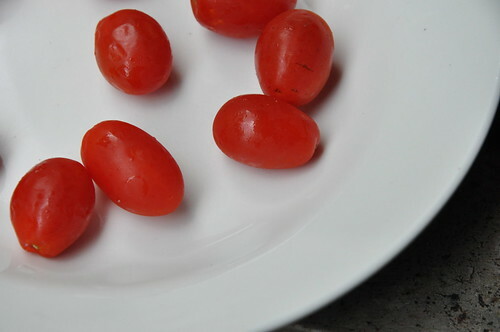 They’ll be even more mouthwatering when lightly dressed with this precocious concoction, and made lovely with a smattering of sweet, acidic grape tomatoes. 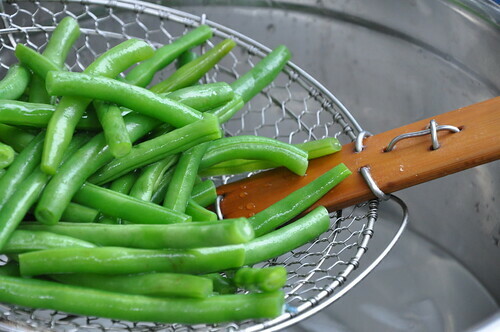 Doesn’t the humble green bean deserve some star treatment? (Especially after years of abuse at the hands of bean canners and cafeteria ladies?) I should say so. This salad was really just an idea I whipped together. Now, it’s become a staple and a frequent demand from the wife. A couple of months ago we were visiting family, and I decided to throw together a barbecue as a quick way to feed a good number of people. I found some great green beans and wanted to serve them cold, but needed a dressing. A few minutes later I put this together, and was surprised to hear the very satisfied, “Mmmms…” and “Can I have this recipe?” requests that started coming my way. A few notes about the recipe. First, when I originally made it, I had yellow wax beans in as well. I would have loved to have put them in this version and in the photos; I think they add a great variety in presentation and texture. However — and I don’t know why because they seemed pretty ubiquitous growing up in the Midwest — I cannot seem to find them easily in Northern Virginia. My family in North Carolina says they don’t see them much either. (So, bean farmers, what’s the deal?) Anyway, I’d recommend them if you can get them. 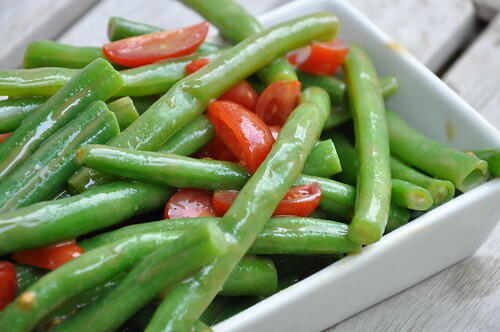 Just use equal parts green beans and yellow wax beans. Second — and this is crucial — you want the beans to be “al dente.” This salad is all about crunch. Better to slightly undercook the beans than overcook them. Therefore, it’s important to pull them from the boiling water and shock them in the ice bath or under cold running water. If you lose that satisfying crunch, I’m not sure even a good dressing makes it worth the effort. 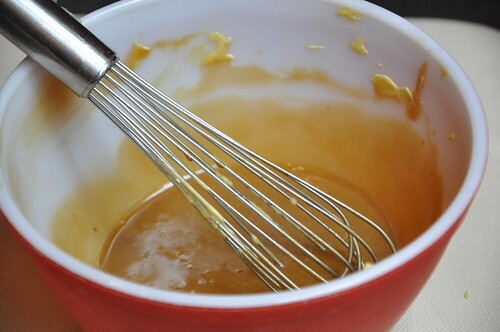 Third, the recipe below produces at least twice as much dressing as you need. I simply keep the rest handy for people to add extra themselves or for a quick version later (currently, I’ve a batch sitting in the fridge in an old Dijon mustard jar). But, with all that extra dressing, use it sparingly. When I overdressed it once, I really felt the green beans and the tomatoes became lifeless and worthless. So, use a careful hand when preparing. 1. Bring to a boil a large pot of well-salted water (it should taste like the ocean). 2. Prepare an ice bath of equal parts ice and water. 3. 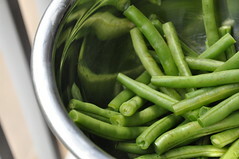 Trim the ends off the green beans and then cook them in the boiling water for 2 minutes. Transfer to the ice bath. 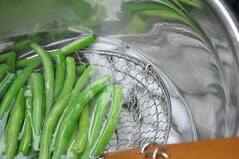 Once the green beans are cool, drain and allow them to air dry. 4. 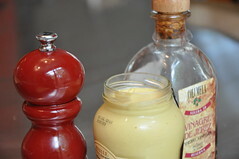 Whisk together the ingredients in the dressing and set aside. Note: The dressing should be just slightly salty. This allows the whole salad to be well dressed. 5. 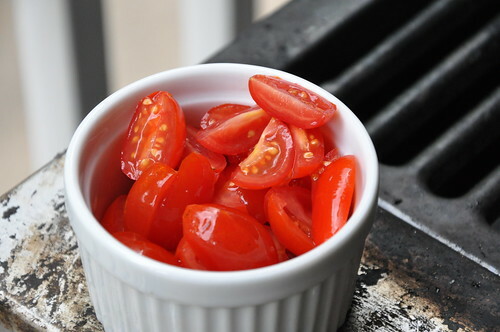 In a large bowl, toss together the beans, tomatoes and dressing. Move to a serving dish and enjoy. Note: In dressing the salad, I typically put very little on the beans, but most along the sides of the bowl and toss the beans to coat. This recipe likely makes enough dressing for twice the number of the beans, but I always make extra and it keeps very well. I LOVE your blog. 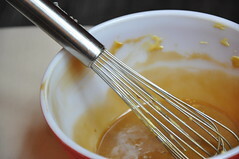 I am also happily married male that cooks, and I really like the partnership feel of your blog. Will be lurking. Thanks for all the effort, and your blog and photos look beautiful! These recipes are really great! if you guys ever go out to eat (doubtful) be sure to post reviews at http://tinyurl.com/26okadh !